Chickens are passive creatures. They have yellow legs, white feathers and wings, black eyes, orange beak and red wattles. They are an important food source for our character because they can be cooked. Moreover, you can take their feathers to create arrows for your bows as well as eggs to generate chicks. Cicken wander over the world without any criteria, though they tend to search for light when they are in dark places. They lay eggs each 7,5 minutes. They will follow you every time you have seeds in your hands. You can make two chickens spawn if you give seeds to both of them. In that moment you will see that hearts are appearing and they will join for a moment, until appears a chick. A chick will grow to an adult after 20 minutes. If you burn a Chicken to the death, it will appear a piece of Chicken already cooked. 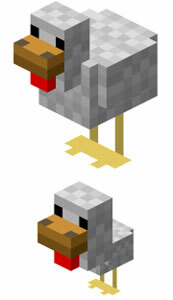 These animals can be at any part of the Minecraft Overworld, always that there are grass blocks and the light level at 9 or more.